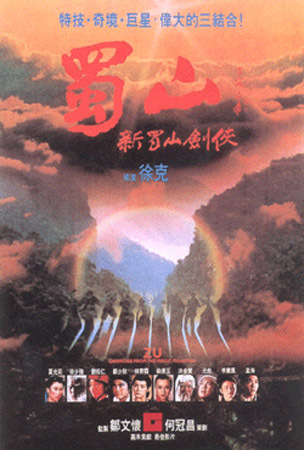 Back in 1990, Channel Four were showing a short season of films under the banner of "Chinese Ghost Stories"; Mr. Vampire (1985), Zu: Warriors From the Magic Mountain (1983), and Encounters of the Spooky Kind (1980), as well as a couple of other films that I forgot to record at the time (they were on pretty late at night, otherwise I'd have watched them too), and I can't really remember what they were, but ever since then, these three movies have stuck with me and are still some of my favourite Hong Kong films ever! Each film really captured my imagination, as a thirteen year old kid; the supernatural shenanigans, the high energy, the balletic kung fu, and kinetic camera work, all came together to produce cinematic magic! I'd never seen anything like it before! Have you seen any of these films? What do you think of them? Which films, if any, got you into Hong Kong cinema? If you've never seen any Hong Kong films, and you're partial to the supernatural, then I urge you to check these out; great entertainment! 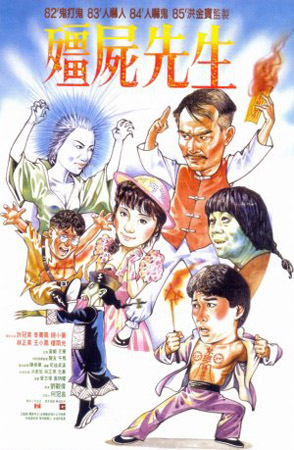 Lam Ching-Ying stars as Taoist priest Master Kau, who runs the local mortuary. A local millionaire businessman, by the name of Mr. Yam, has requested that Kau arranges for his father's reburial, after being advised by a fortune teller, as the previous burial had had bad Feng Shui, causing ill fortune for Mr. Yam and his business. The bad fortune however does not end there; when Yam's father's coffin is dug up, Master Kau and his assistants Man Choi (Ricky Hui) and Chou (Chin Siu-Hou) open it up to find his body is still miraculously well preserved. It transpires that his soul has yet to leave his body, and over the next few days it's clear that Yam's father is turning into a vampire! Not one of the Dracula variety, but a Chinese "Geung-si" (hopping vampire, quite different from western vampires). Further mishaps ensue, causing Yam to transform into a vampire, Chou being haunted by a seductive female ghost (a wonderful performance by Pauline Wong), and Ricky Hui showing his comedic chops as Man Choi slowly transforming into a vampire too! Can Master Kau save the day? Mr. Vampire is regarded as a classic of Hong Kong cinema, and rightly so too. From the opening scenes, the overall tone of the movie is clearly established, and we know what we have in store for us. All the ingredients for a manic romp of a horror comedy are present, effectively combining acrobatic kung fu skills, blended with the occult and supernatural paraphernalia, and just the right amount of slapstick comedy; everything one would hope for in a film about hopping vampires versus Taoist priests! Lam Ching-Ying gives a cool central performance as Master Kau, playing it straight, leaving the comedy to Ricky Hui, Chin Siu-Hou, and Billy Lau (in the role of Yam's nephew, Police Inspector Wai). Also, giving a nice performance is Moon Lee, who stars as Lam's daughter Ting-Ting. She would later go on to become an action star in her own right, and the vampire is played by Yuen Wah (fellow Seven Little Fortunes classmate of Jackie Chan, Sammo Hung and Yuen Biao). The make-up and special effects look dated by today's standards, but add a certain charm to the film, and anyway, you're too busy enjoying yourself that you don't really care. I can't stress enough how much fun this film is; it has a good amount of ghost busting and vampire hunting, it's funny in all the right places, and knows exactly when to crank up the action. The only criticism I might level at the movie, is that I would have preferred a little more kung fu action. That being said, this is one entertaining film not to be missed by fans of Asian cinema. Yuen Biao plays Ti Ming-Chi, a soldier fighting for one of the warring factions in 5th century China. 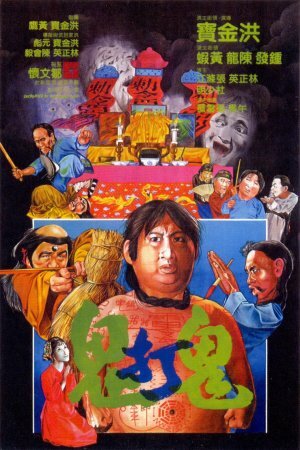 After fighting it out against a soldier of an opposing clan (played by Sammo Hung), he finds himself in a cave and is soon attacked by supernatural enemies. To his rescue comes Ting Yin, a heroic swordsman (Adam Cheng), who spends much of his time hunting these evil creatures. His rivals, a monk and his apprentice Yi Chen (played by Mang Hoi) are on a similar mission. As the story progresses, it transpires that the universe is under serious threat from the Blood Demon, and it's up to the forces of good to defeat the evil that plagues the world. Unfortunately, those with the power to do battle with such evil, are too busy fighting amongst themselves, so it's down to Ti Ming Chi and Yi Chen to seek out the legendary twin swords and save the day! Can they do it..? Tsui Hark's fantasy adventure is a visual treat! Effects man Robert Blalack, and various other Hollywood special effects wizards who had worked on films such as Star Wars (1977) and Tron (1982) were brought in as visual effects consultants to help with the state of the art animation and effects techniques. The results do look somewhat dated now, but they're so inventive and full of energy, it's easy to forgive and forget. The film moves at quite a brisk pace, with characters leaping and flying from one scene to the next, and so many action set pieces to enjoy, along with a little comedy thrown in for good measure. There's an all-star cast with a wonderful turn from Brigitte Lin as the Countess, and an early role for Moon Lee as one of the Countess' guards. Sammo Hung as Master Long Brows is a sight to behold as he fights to contain the Blood Demon with his, er, eyebrows! The film changed the Hong Kong film industry and the way they made films, and it went on to be hugely influential, with John Carpenter (Halloween, The Thing) crediting the film as being a major influence on his own supernatural film, Big Trouble In Little China (1986). There's no doubt this film's unique and exciting style will grab you. It deserves your attention! Sammo Hung stars as Cheung, a man who loves to boast how fearless he is. Little does he know, that his wife is cheating on him with his wealthy boss, Mr. Tam, who Cheung taxis to and from the local brothel. Upon returning home from work early one afternoon, Cheung find's out about his wife's indiscretion, but Tam escapes before Cheung can recognise him, so Tam decides to remove Cheung from the picture altogether, to stop him from identifying him, and causing further trouble. Master Chin's brother, Master Tsui, warns him against killing and doing bad deeds, and decides to help Cheung avoid any trouble at the temple. Using magic and invoking the spirits of the gods, what follows is a deadly battle between the two masters and their unusual skills. This highly influential film is credited as the film that started the whole action horror genre in Hong Kong cinema. The film, featuring Chinese hopping vampires, which later would become the basis of the Mr. Vampire series of films, is one of the most fun and action-packed films going. Sammo Hung writes, stars, and directs, creating an incredible mix of fast-paced kung fu action, visual comedy, and bizarre magical practices. The fighting scenes are supremely choreographed, with a great fight scene in a tea-house involving Lam Ching-Ying's police inspector fighting against his own men who are under the control of one of the wizards voodoo-like magic. Incidentally, fans of the Northern Irish band Ash may recognise that they sampled this scene for the intro to their song Kung-Fu (1995) (which features over the end credits of the European/American release of Jackie Chan's Rumble in the Bronx (1995)). Later, when Cheung and his opponent's are possessed by the spirits of the gods, some sublime fighting skills can be seen, with various weapons being wielded, in the brilliant showdown between the two mystical masters. This movie spawned a new genre of film making, and is also said to have inspired Sam Raimi's The Evil Dead (1981). You should definitely check out some Hong Kong movies! These old-school ones are great; they have a certain charm, I think, that's missing from modern cinema, and an infectiousness that makes you want to see more! Some Crayon Pop fans there judging by all that jumping! Must watch them again! Thanks for the reminder. Haha, yes, the jumping vampires love themselves a bit of Crayon Pop! And yes, go watch those films again! !